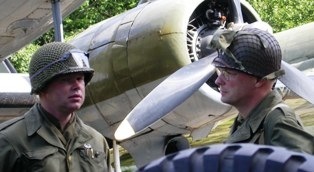 This years re-enactment will be at Eindhoven. This city, and its roads with their important bridges, was the objective of the 101st Airborne Division. The Screaming Eagles took the city the second day of the operation. Having some interesting photos of the liberation of Eindhoven, the choice for this year is... Eindhoven! 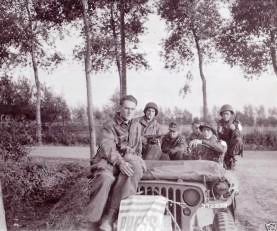 There are a few photos of the photographers that went along with the 101st, but there’s a well known picture of a jeep bringing in Kraut POWs. The jeep is marked with a “Press Bag”. But it was also used by the Signal Corps men for marking their vehicles by fastening the bags to the bumper, grill or windshield. Other pictures are published of cameramen waiting by their WACO gliders. 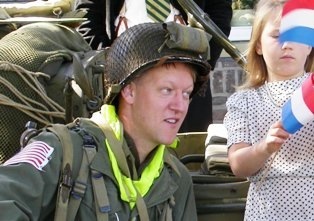 For recreating the 101st in Eindhoven, there will be some uniform items mandatory. First of all is the invasion flag brassard. No flags were worn during the Normandy campaign, but for the Holland Jump the 101st wore a white brassard of oil-cloth with the Stars and Stripes printed on. Some soldiers worn the armband just as it was supposed to, others cut the brassard down and secured the flag with the safety pins. Some troopers took the time to sew ‘em down. 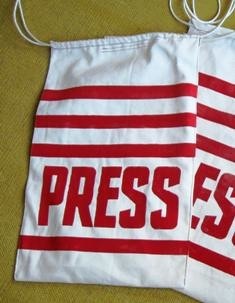 This, off course, on the right sleeve. After Normandy the rubberized gasmask bag proved not being satisfactory. For the next operation the paratroopers were to be equiped with the lightweight gasmask. The gasmask was not a personal item, but was issued by the Chemical Warfare Service when considered necessary. After the 82nd got their share, there wasn’t enough any more for the 101st to go around. So most units of the 101st were issued the old M5 assault gasmask. The helmet netting the 101st used was a mix of the 1/2 inch netting they used in Normandy and the British fine netting (same as the 82nd used), to replace the worn/lost ones. The jump suit the troopers wore is the familiar M43 combat suit, with canvas pockets added to the pants. Completed with the old jump boots or the new buckle boots. Remember, after returning from Normandy the glidermen were issued the same combat clothing. That includes the well coveted jump boots! But, most glider infantry still used the cumbersome haversack, although some were lucky to lay their hands on a musette bag. A mix of US made and British made equipment can be worn, and the British bright yellow recognition scarf/triangle was used for the first time. Gone were the small Air Corps ammunition pouches. The riflemen just used the prescribed cartridge belt or bandoleers for their M1s.